David Mussar posed the question of plant habit when hybridizing with FORESTLAKE RAGAMUFFIN. In some circles of thought, hybridizers suggest that the pod parent is responsible for plant habit. FLR was registered at 28 inches, with a 5.5 inch bloom. Checking the database for introductions out of FLR, the tallest is 42 inches. It was crossed with Strawberry Candy which is registered at 26 inches. This cross leaves me wondering, how is this possible? FLR does not have any known tall parents. Neither does STRAWBERRY CANDY. The tallest FLR introductions as a group are daylilies crossed with Tetra SPINDAZZLE. John and Jamie had multiple seedlings from this cross. None of the seedlings that I know of were shorter than 30 inches. That defies sense also as SPINDAZZLE was registered at 26 inches. The shortest daylily registered out of FLR was hybridized by Fran Harding. FORESTLAKE WARM AND FUZZY which was registered at 18 inches with a 5 inch bloom. Glancing at all of the in the dbase crosses, I’d guess FLR breeds an average height of 28 inches and average bloom size of 5.5. If I broke down the crosses by line breeding vs. outcrossing, you’d end up with an average height less than 28 inches for line breed crosses, with outcrosses, your average height would be greater than 28 inches. 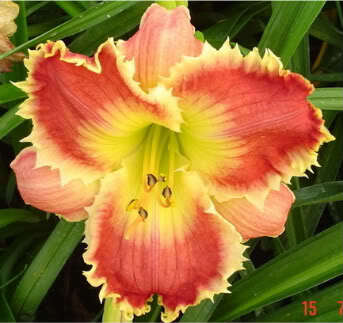 This entry was posted in Daylily Hybridizing, Introductions, Seedlings and tagged Dave Mussar, Forestlake Ragamuffin, silence of the lambs, SPINDAZZLE, teeth. Bookmark the permalink. I would like to suggest that you post something on Larrys obsession. Im wondering where those fantastic teeth came from. I just dont see it in the parentage. Maybe you can shed some light.